Music that is woven into the fabric of the United States. This is American heritage music. This is your birthright. Own it. This is post 4 of 4 in the series How to Go from Rock to American Heritage Music. One song on the Byrds’ Sweetheart of the Rodeo album, “I Am a Pilgrim,” has a songwriting credit that attributes it to “traditional.” My understanding at the time I first heard the song was that traditional meant it was so old that no one remembers who wrote it.Later I learned that “traditional” is a term, like “folk music” and “old-time music,” that has been defined in different ways. Some people spend a lot of time and brainpower discussing, dissecting, and debating the minutiae of these definitions. Fortunately for you, I am not one of those people. For our purposes, let’s just expand my original definition a little. A song can be traditional even if the name of the songwriter(s) is known. Traditional songs are those that are performed by custom in a community and have been passed down orally, or aurally, over a period of at least a few generations. Close enough. “I Am a Pilgrim” is of unknown origin. It seems to be related to many different 19th century song texts. It was possibly an African American spiritual from the time of slavery. Trying to determine the origins of a traditional song of unknown origin is part of the fun and frustration of folk music. The earliest recording that I have been able to identify is by the Heavenly Gospel Singers, recorded on February 13, 1936 in Charlotte, North Carolina. The song has been recorded by many others, including Merle Travis, Johnny Cash, Alabama, Willie Nelson, and Doc Watson. 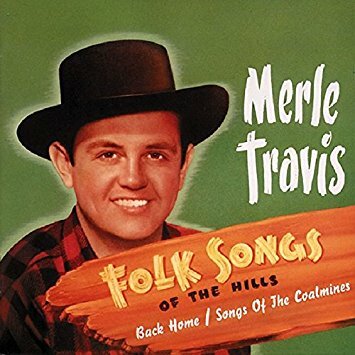 Some people mistakenly attribute its authorship to Merle Travis, possibly because his version provided the blueprint for some of the versions to follow. In the spoken introduction for his 1946 recording of “I Am a Pilgrim” (below), Merle indicates that he learned the song in his youth at the camp meetings and Brush Arbor meetings (religious gatherings) presumably in or near his hometown of Rosewood, Kentucky (Muhlenberg County). Depending on how old Merle, who was born in 1917, was when he “first got big enough to start running around by myself at night,” this supports the idea that the song was in circulation prior to the recording by the Heavenly Gospel Singers. Here is the 1968 recording from the Byrds’ Sweetheart of the Rodeo. 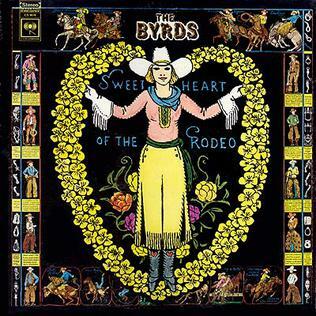 The Byrds’ Sweetheart of the Rodeo album started me traveling down a most unexpected road that led to country and folk musicians the Louvin Brothers, Woody Guthrie, Leadbelly, and Merle Travis. This was only the beginning of my journey into American heritage music. Little did I know how far the road would go, how many forks it would have, and how long I would travel it. It’s been more than two decades and I’m still fascinated by what I find around every bend. This is post 3 of 4 in the series How to Go from Rock to American Heritage Music. I don’t remember the first time I heard or read the name Woody Guthrie. Does anybody? For what seems like my entire life I associated him with “This Land is Your Land” and nothing more. As my musical outlook was expanding in the 1990s, thanks in large part to my exploration of the Byrds’ Sweetheart of the Rodeo album (see part 1 of this series), I happened upon a CD called Folkways: The Original Vision. The album, which launched the nonprofit Smithsonian Folkways label in 1989, was a collection of Woody Guthrie and Lead Belly recordings from the 1940s. The album included one of Lead Belly’s several recordings of “Midnight Special,” a song that I knew from Creedence Clearwater Revival’s later version. “Midnight Special” is a traditional folk song that became a staple among folk and rock singers. It has been performed and recorded by Little Richard, Van Morrison, Harry Belafonte, Paul McCartney, and many others. Another Lead Belly song from the album, “Rock Island Line,” was covered by the Beatles in their original incarnation as a skiffle group, The Quarrymen. Skiffle was a music craze in England in the 1950s that consisted of British youth playing American folk and blues songs on whatever instruments they could obtain or devise. Many of the rock artists associated with the 1960s British Invasion, including the Rolling Stones, the Animals, and the Who, started out listening to and playing skiffle. Skiffle bands learned more than a few songs from Lead Belly and Woody Guthrie records. The Lead Belly songs on Folkways: The Original Vision were more interesting and satisfying to me at the time than the Woody Guthrie songs, but the influence Woody had on one of my favorite artists, Bob Dylan, was unmistakable. Before he began writing his own songs, Dylan was “like a Woody Guthrie jukebox,” as he later described himself. When he did begin writing songs, Dylan borrowed melodies and song styles from Woody. 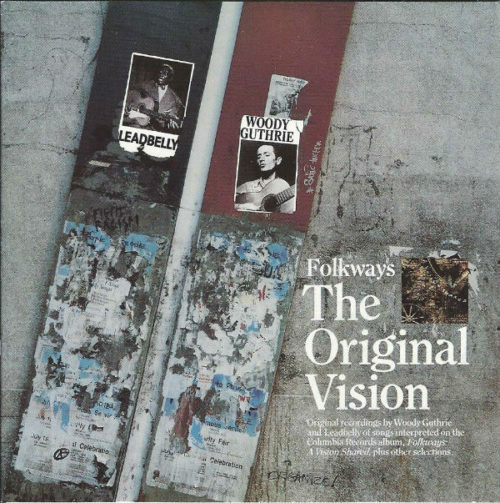 Folkways: The Original Vision included one of Woody’s recordings of “Pretty Boy Floyd. ” This song was covered by the Byrds on Sweetheart of the Rodeo. The floodgates were open. The connections I was making between older folk and country music and the rock music I loved were undeniable, and I was compelled to swim further up the stream. Continued in part 4 of 4. Sign up to receive future posts by email using the box on the right. This is post 2 of 4 in the series How to Go from Rock to American Heritage Music. The first time I heard the Louvin Brothers, one of the artists covered by the Byrds on their Sweetheart of the Rodeo album, I was struck by how much their sound and vocal harmonies reminded me of the Everly Brothers. I loved the Everlys and many of the artists who were inspired by their vocals, including the Beatles, the Byrds, Simon and Garfunkel, and the Beach Boys. 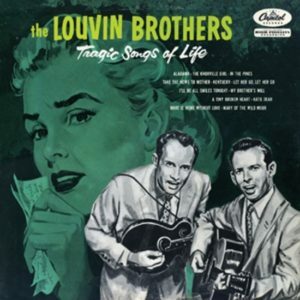 Could the Louvin Brothers be the source of all this musical magic? Not exactly. The Louvin Brothers, who first recorded in 1947, listened to older harmony duos, including the Monroe Brothers (first recorded in 1936), the Blue Sky Boys (first recorded in 1936), the Delmore Brothers (first recorded in 1931), and Mac and Bob (first recorded in 1926). No doubt the harmonies and some of the repertoire of folk, country, and sacred songs performed and recorded by these duos predates the era of recorded sound in the music of the Appalachian Mountains, where the duos originated. After scoring top ten hits with “Bye Bye Love” and “Wake Up Little Susie” from their self-titled debut album in 1958, the Everly Brothers released an album called Songs Our Daddy Taught Us. The album featured traditional folk and country songs the brothers learned from their father, Ike Everly. Ike was a guitar player who had worked in the coal mines in Muhlenberg County, Kentucky, and the songs he taught his sons were cut from the same cloth as those recorded by the Louvin Brothers, Monroe Brothers, et al. The Louvin Brothers first came to my attention in 1997 shortly after Capitol Records released three of their classic albums on compact disc. An article by David Cantwell that appeared in Miami New Times piqued my interest, and I purchased Tragic Songs of Life (originally released in 1956) and Satan is Real (originally released in 1959). 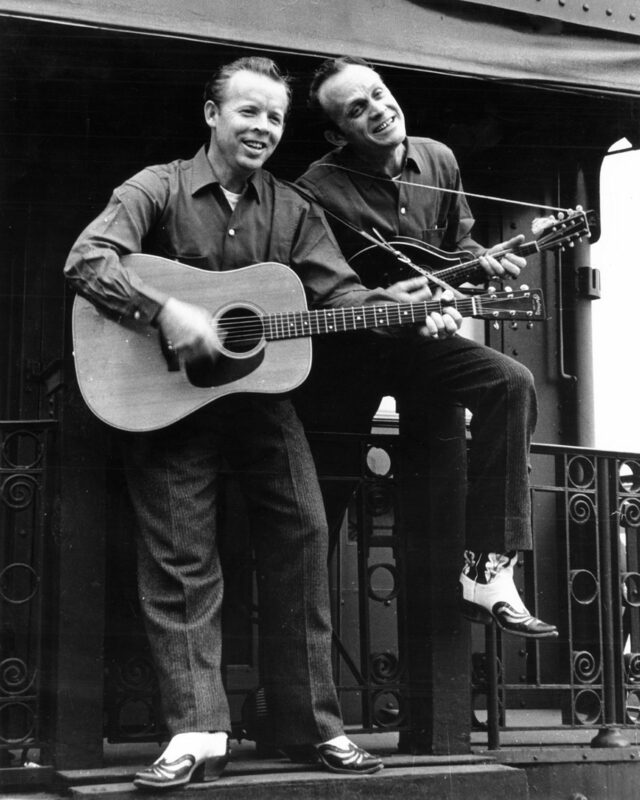 The Louvin Brothers were a musical duo consisting of brothers Ira (guitar and vocals) and Charlie (mandolin and vocals). They began their career in the 1940s singing gospel music. Until they split up in 1963, largely because of problems caused by Ira’s excessive alcohol consumption, they performed and recorded a mix of gospel and secular folk and country music that often focused on themes of God, family, love, and loss. As Cantwell wrote, “If you said these harmonies were the closest anyone has ever come to actually simulating the pain of human loss and desire right there in the recording studio, you would probably be right. But you still wouldn’t be doing them justice.” The Cantwell article is a good place to start if you want to know more about the Louvins and their music. I don’t quite recall how I made the connection between the Louvin Brothers and the Byrds’ Sweetheart of the Rodeo (see part 1 of this series). 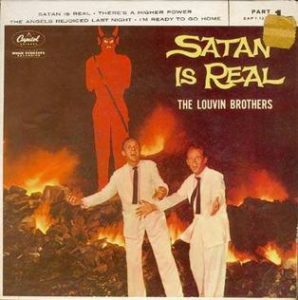 I don’t know if I bought the Louvin Brothers albums because I recognized that one of their songs, “The Christian Life,” was covered by the Byrds on Sweetheart, or if I only discovered that when I heard their original version on Satan is Real. But no matter. The Byrds had eased me into the sounds of country music, and I learned that it wasn’t so bad. In fact, it could be downright beautiful. And I was learning that country music was elemental to rock & roll. Continued in part 3 of 4. Sign up to receive future posts by email using the box on the right. This is post 1 of 4 in the series How to Go from Rock to American Heritage Music. OK – so I wasn’t really a hard rocker or metalhead, but my gradual discovery of American heritage music was a revelation that caused a transformation in me. I found that much of the music in America today is part of a continuum that reaches back to Colonial America and stretches across the Atlantic Ocean to the Old World. American heritage music includes, but is not limited to, traditional folk songs, fiddle tunes, ballads (both Old and New World), sea shanties, railroad and cowboy songs, Appalachian, ragtime, spirituals, work songs, minstrel, blues, jazz, jug band, rhythm and blues, old-time, country and western, bluegrass, and rock & roll. Being on this journey has deepened my understanding and appreciation of many genres of music, new and old. The music connects me to the strength and beauty that have emerged from the often troubled history of the United States. I believe that it can do the same for you. I’m still traveling down this path of discovery, and I am happy to point out some of the highlights that I find along the way, if you care to join me by reading this blog. This is American heritage music. This is your birthright. Own it. The Beatles were my first love musically, and most everything I listened to was influenced by them. I was one of those “I like all kinds of music, except country” people. Upon hearing Bruce Springsteen’s Tunnel of Love album (1987), I commented that it was “too country” for me. Now I own and play seven different banjos and write a blog called American Heritage Music. The album that opened the door for me was The Byrds’ Sweetheart of the Rodeo. It was sometime around 1990, and I was in college. I liked The Byrds, but I was primarily familiar with their hits. Although we were squarely in the CD era, my housemate (future Rambling String Band bassist Chris DeAngelis) had a turntable and a massive record collection. Stumbling upon Sweetheart of the Rodeo, I dropped the needle and found that it wasn’t the rock (or folk/rock) music that I was expecting, though the title and cover may also have clued me in to that. It was country music. I didn’t know much about country music, but I knew this much – I did not like country music. But I liked Sweetheart of the Rodeo. A lot. 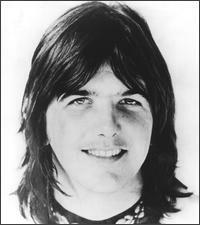 The album was largely the vision of Gram Parsons, who was a member of The Byrds only for the recording of this one album. There were contributions by Nashville session musicians, including Lloyd Green on pedal steel guitar, John Hartford on banjo, fiddle, and acoustic guitar, and Clarence White on electric guitar, who become a full-time member of the band following Parsons’ departure. Today, with the popularity of Americana music and artists like Wilco, Ryan Adams, and Jason Isbell, all roads lead back to Sweetheart of the Rodeo. As the first country rock album by a major artist, it essentially launched the genre of Americana music decades before that term would be used. From Pure Prairie League to the Nitty Gritty Dirt Band, to the Eagles and beyond, the influence of Sweetheart is well-documented and can be easily heard. But this story and blog is not about what came after Sweetheart of the Rodeo. It is about what came before. (see Americana: How Country and Roots Music Found a “Brand New Dance” for what came after). The album included songs written by Bob Dylan (“You Ain’t Goin’ Nowhere” and “Nothing Was Delivered”), another one of my favorite artists at the time. There were a few songs penned by Gram Parsons (“One Hundred Years from Now” and “Hickory Wind,” co-written by Bob Buchanan). One song was written by Merle Haggard and another by soul singer and songwriter William Bell. It was the songs written by three other names that really started me on my journey backwards in time to the roots of American music: “The Christian Life”by the Louvin Brothers, “Pretty Boy Floyd” by Woody Guthrie, and “I Am a Pilgrim” by Traditional. Continued in part 2 of 4. Sign up to receive future posts by email using the box on the right.